Home Taste of Tradition Royal Cuisine, Royal Thai! Bringing you the Kingdom’s best food outlets, this week we have the Royal Thai Restaurant that’s located at the Gulf hotel Bahrain! 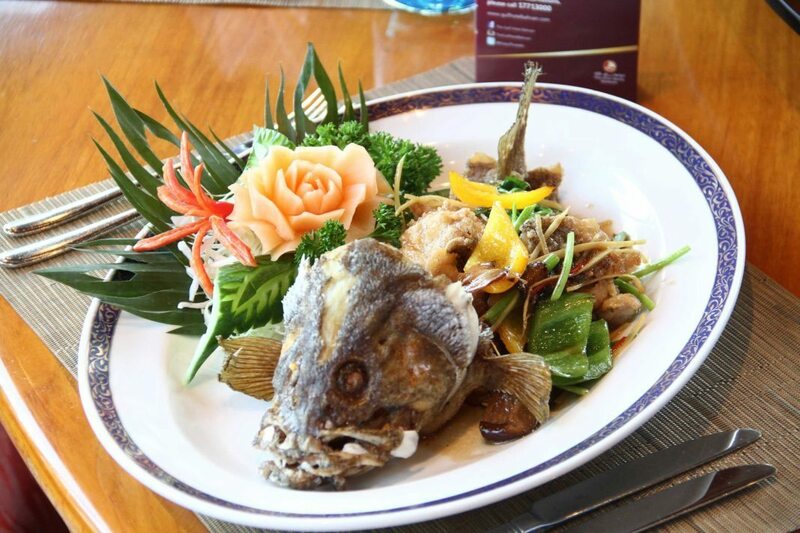 Just letting you know, The Royal Thai never fails to impress it’s discerning guests. The restaurant is situated in a grand pagoda in the grounds of the hotel’s tropical gardens and provides scenic views overlooking the turquoise waters of the outdoor swimming pool. The restaurant greets its guests with enchanting Asian décor and world class Thai cuisine. A spectacular seafood menu offers visitors a huge choice of temptation with lobster, crab, snow fish, clam and hamour that can be fried, boiled, curried and spiced to perfection at the onsite stations. What BTW brings this week is the Chef and Dish of the week; Chaiyaphat Juntaranikool giving us some lessons on how to make the dish of the week Hamour with Ginger and Celery! If you don’t have the Khaleej Live App yet, download the App and scan the Image with the khaleej Live logo.